We have seen a gradual decline in the proportion of X trades on HKEX since 2017. This is partially a function of the market, where retail and Southbound flow cannot trade in the dark and/or cross. Historically, retail flow represented around 20%-30% of turnover, broker principal trading accounted for around 20% and institutional flow accounted for around 50% of the HKEX turnover. * Stock Connect Southbound now contributes about 9% of turnover. These factors may explain why the percentage of X trades has currently fallen to approximately 2.5% after peaking in late 2016 at 3.5% of the market. Despite the reduction in institutional flow as a percentage of the market, block trading (over USD1m) remained stable in 2017 through to Q3 2018, when further growth became evident. We think the recent drop in market volume can be attributed to the impact of the US-China trade war as well as investors questioning the Chinese local economy and tech industry. In Australia, broker dark executions (ex-Centre Point) have remained stable throughout recent quarters. Centre Point maintains around 8% of market volume. Since 2012, Australia has been operating under revised dark trading rules where price improvement and trading in size are the keys to navigating the new landscape. With a number of international players opening local Australian offices and local firms increasingly investing abroad, the ability and willingness to address global regulation can be viewed as a commercial advantage. Following the issue of RG. 97 by the Australian Securities and Investments Commission (relating to the requirement for issuers of superannuation products to disclose direct and indirect fees and costs in their product disclosure and periodic statements provided to retail clients), local investment teams and trading desks still have to contend with the impacts of MiFID II arriving from Europe. Since 2017, we have seen an increase of block trading (as per ASIC’s block definition) from 13% to almost 18% in Q1 2018 before stabilizing at just over 16% in Q3 2018. Historically, block trading (over USD1M) in Japan was merely a rounding error, not accounting for more than 1% of the overall market volume. The ToSTNeT (Tokyo Stock Exchange Trading NeTwork) mechanism, which allows crossed transactions to be reported, has seen stable market share in the past two years at around 7.5% of the overall market. The main change we see in Japanese equity trading is the recent rise by 50% of blocks being reported between late 2016 and peaking in late 2017. Local regulations prevent Japanese banks from splitting the cost of execution and research resulting in (for the majority) the continuation of bundled relationships with a large number of clients. 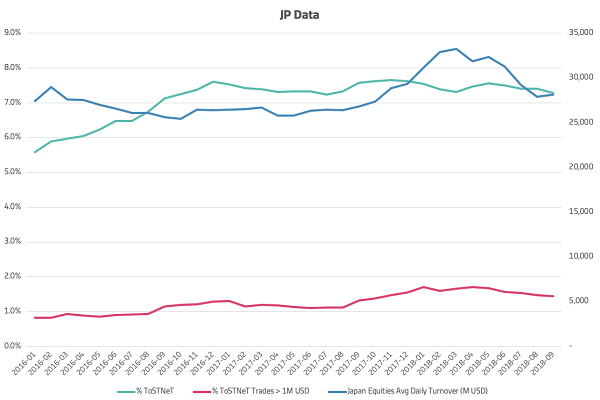 Based on anecdotal evidence from our conversations with the buy-side, we see a trend for investors to re-papering their trading relationships outside of Japan (mainly in Hong Kong and London) with international players. This allows local banks to maintain their relationships with firms falling under the scope of MiFID II as well as following the rules for commercial reasons. A number of these firms have historically been trading Japan through overnight benchmarked (often to VWAP) orders. This allowed them to limit the execution risk when not trading live Asian hours as well as collect credit to pay for research. Under the prevailing themes of best execution, this model is now being challenged and firms need to reassess how they review their trading performance. Indeed, especially on small and mid-cap stocks, achieving the VWAP benchmark can still mean negatively impacting volumes and price. With off-shore players changing their trading style and impacting market structure, on-shore players may be challenged to review how they trade. Global regulation is still a key driver in market structure. The rise of concepts such as Large in Scale, Periodic Auctions and Systematic Internalisers under MiFID II in Europe continues to be monitored closely by market participants. The Hong Kong Securities and Futures Commission reminded firms in January 2018 to execute client orders “on the best available terms”, guidance which mirrored action by the Monetary Authority of Singapore who issued a consultation paper with draft guidelines on the execution of clients’ orders and standards for best execution in Q4 2017. As mentioned above, Australia’s RG.97 indicates issuers of superannuation funds must disclose direct and indirect fees and costs in their product disclosure and periodic statements provided to retail customers. FINRA’s review on Best Execution (December 2017) - Regulatory Notice 15-46, addresses concerns that firms failed to conduct adequate regular and rigorous reviews on the quality of the executions on customers’ orders and make any necessary modifications. Manitoba legislation in Canada is giving IIROC greater powers to deliver investor protection including the legal ability to enforce fines against individuals. The sustained growth of block trading in Europe has been coupled with the rise of periodic auctions and Systematic Internalisers. It is evident that APAC market structure is undergoing its own evolution. Not having experienced the same fragmentation faced elsewhere, block trading continues to emerge as a rising execution mechanism. In an increasing competitive environment where trading desk responsibility is increasing and with alpha generation becoming a key driver to maintain profitability, more teams are turning to new technology. It is no surprise that we see an increase in artificial intelligence and machine learning technology being developed and implemented for the trading desk. There is a distinct need to enable the desk to sift through the overload of information they are inundated with. Advances in this area will help trading desks get alerted only on news or events that are actually relevant to their order pad.